Greenwich Academy’s Katie Goldsmith, left, mixes it up with King’s Hope Deschapelles during a game in 2017 in Stamford. Following successful seasons, the Greenwich Academy and Sacred Heart Greenwich soccer teams had numerous players honored for their achievements this fall. 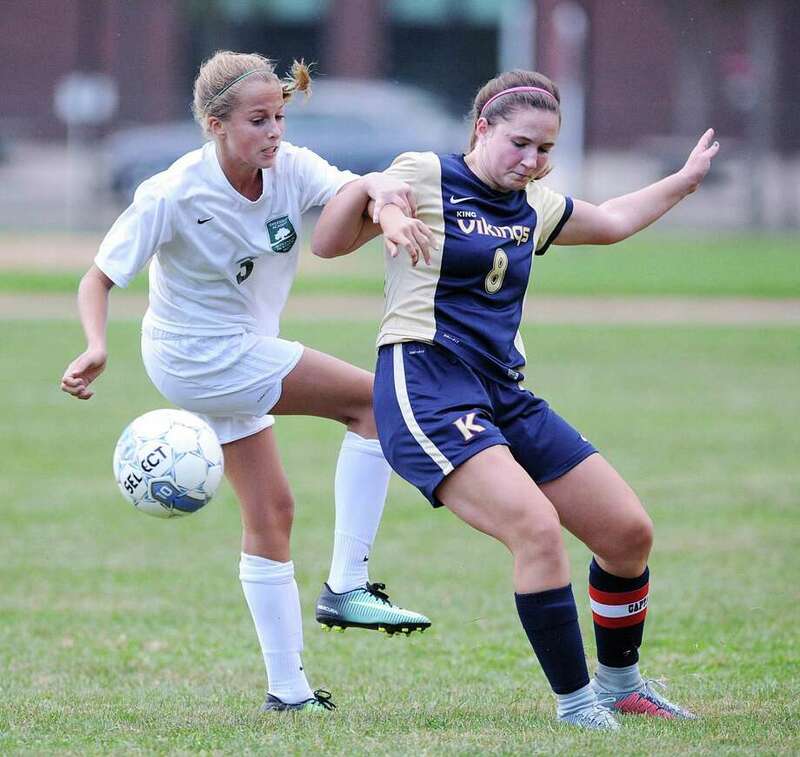 Christina Maldonado and Katie Goldsmith of Greenwich Academy were among the prep school players that were selected as members of the Connecticut Girls Soccer Association All-State Team. A junior, Maldonado was a standout defender for the Gators, who captured the FAA Tournament championship for the third consecutive season and posted an overall record of 12-3-3. Goldsmith, also a junior, was a dynamic playmaker at the forward position for Greenwich Academy. Like her previous two seasons on the squad, she was one of the team’s leading scorers. Maldonado was also earned All-WNEPSSA Team honors, along with Greenwich Academy teammate Tessa Brooks. A junior forward, Brooks produced another productive season, tallying a number of clutch goals for GA.
Goldsmith, Maldonado, Brooks and junior Taylor Lane were each chosen as members of the All-FAA Team. Lane was also one of Greenwich Academy’s top offensive threats. Karina Toub, who served as a senior co-captain for GA, was an All-FAA honorable mention selection. For Sacred Heart, sophomore Fernanda Serna, sophomore Lara Patricio and junior Amelia Sheehan each earned All-FAA Team accolades. Serna was a midfielder, while Patricio sparked the Tigers at forward and Sheehan played multiple positions. Alana Frederick, a sophomore forward, was an All-FAA honorable mention selection for Sacred Heart, which advanced to the FAA Tournament semifinals. Junior forward Taylor O’Meara, who helped lead Sacred Heart offensively, made the All-WNEPSSA Team, along with Serna. Christina Stone (Loomis Chaffee), Kayla Thomas (Taft) and Sofia Weber (Hotchkiss).